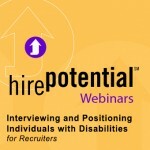 Preparing your recruiting team to easily navigate and gain a comfort level meeting and interviewing applicants with a variety of disabilities. Creating a comfortable environment for all. 1.5 Hour Session conducted via webinar. This introductory module is appropriate for all members of your recruiting and talent acquisition teams. The module is interactive and provides a solid foundation for successfully recruiting people with disabilities.